There is diffused sunlight illuminating this scene from above. The rider on the pale horse. 01) (This page) Revelation 06 – The Scroll seals – Scene 04 – Fourth seal: Pale rider (with scroll). 02) (Next page) Revelation 06 – The Scroll seals – Scene 04 – Fourth seal: Pale rider (without scroll). The main difference between the two versions is the inclusion or absence of the 7 seal scroll in the bottom left corner of the scene. I wondered if it might detract from the overall impact of the scene for some viewers, hence its absence in the 2nd version. When the fourth seal was opened, a pale horse came forth. The word “pale” is a little misleading, as we would naturally think that means white, grey, or some other off-shite colour. In fact “pale” literally means pale green, and is the same word used in reference to vegetation; eg in Mark 6:39; where Jesus directed the 5,000 men to sit on the green grass. Having read that description, I decided to make the horse and rider the colour of diseased, gangrenous flesh. You can see through the horses and rider’s transparent skin, to the bones, blood vessels and tissues beneath. Verse 8 states that “Its rider was named Death, and Hades was following close behind him.” I don’t think this is the personification of death and Hades, but rather a poetic device to indicate the severity of the fourth rider’s effect upon the earth. Hades was the name the Greek and Roman’s called their “god” of the underworld and he was the ruler of the dead. The underworld itself was also known to the Greeks as Hades. I think this may mean that after the first three riders, who brought war, famine, and death, then people will fall prey to a plague and pestilence. Also the wild beasts of the earth (carnivores like lions, hyenas, tigers, etc) will increase in numbers and take advantage to kill human beings. In the last sentence of verse 8 it is revealed that a fourth of the earth will be killed by this fourth rider. This certainly seems to support the conclusion that the Great Tribulation has begun: an unprecedented time of trouble on earth (see Jeremiah 30:7 *1; Daniel 12:1 *2; Matthew 24:21-22 *3). I have added the steel armoured head piece on the horse, in keeping with the other horses in the previous scenes. 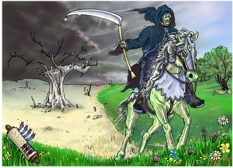 The rider carries a bone handled scythe and is wearing a dark cloaked costume, to increase the sense of brooding doom about to come upon the earth. Notice that the foreground and right side of the mid and background has wild flowers, grass and trees, and looks very picturesque, but where the horse and rider have been the grass and flowers are rapidly dying, in a “v” shaped pathway of death, behind them. The sky on the right is blue with small clouds, whereas the left hand side of the sky is dark with green, deep violet and black storm clouds gathering, which further indicates the calamity about to be unleashed upon the earth. Here’s the initial greyscale pencil sketch I drew of this cartoon. 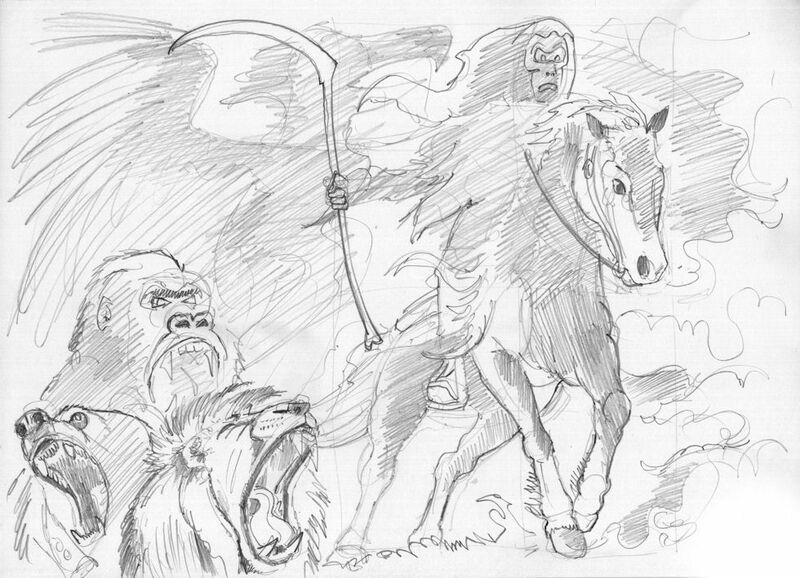 “The wild beasts of the earth” (verse 8) in the foreground were deleted from the final scene. 21 For then there will be great distress, unequalled from the beginning of the world until now—and never to be equalled again. 22 If those days had not been cut short, no-one would survive, but for the sake of the elect those days will be shortened.